I have always been at least a little infatuated with 1970s style. My high school peers can attest to the fact that I was wearing thrift store wide-leg pants and polyester tops in the late 1990s (I was definitely NOT nominated for the “Best Dressed” Senior Superlatives). At that point, I was also listening to ska, waking up at 4am to attend daily church classes, and trying desperately not to be The Most Awkward Girl in the Room, so I can’t really claim great decision-making abilities as a teen. But that was the start of my love for vintage style and Goodwill fashion. Since then I have amassed a healthy collection of vintage patterns, including this exquisite number by Bob Mackie for McCalls from 1979. I made it a few years ago and have been on the fence about the fit and style ever since. It’s a true wrap dress with 2 sets of hooks and eyes in the waistband as the only things holding it together. I also have 2 strategically placed safety pins at the bust and skirt so I can get away with wearing it to work. I wore it off and on for a while and last wore it when I was about 6 months post-partum. I felt so gross and lumpy in it then that I threw it into the back of the closet and ignored it for two whole years. I recently pulled it out again, having lost then re-gained 10 lbs, and it turns out I love it again. But the pattern wasn’t very easy to put together, and it does expose quite a bit of skin without those safety pins. When Christina Albeck of Wardrobe By Me posted that she was working on a wrap dress pattern I remembered this dress and thought, “If anyone can make me fall in love with making a wrap dress again, Christina can”. And so I patiently waited for the tester call. And I googled and pinterested Diane Von Furstenburg wrap dresses like crazy. And I inventoried all my knit fabric to think about which I would use for my muslin, and which for my final. Find the pattern here. Polyester mystery blend- probably 7 years old, purchased in the LA fabric district and intended for a different vintage wrap dress pattern (I might have a little problem). Straight size 6, no mods; short sleeves. It came together really quickly- probably 3 hours total from print to hem. I always print and tape one night, then sew the next. Sleeves and skirt not hemmed yet in this pic. Art Gallery Wonderland Collection, Enchanted Leaves Air Knit cotton lycra purchased from Peekaboo Fabrics as a gift from my amazing friend/ mother-in-law. The white solid is brushed poly from Zenith & Quasar (I want to always use this, always and forever, for all my solids, forever. I LOVE it!) Size six, 3/4 sleeves, no mods. I am wearing a slip beneath the dress, so that is the little bow you see peeking out at the cleavage. For normal day wear, I’ll pair this with a white cami. Photo credit for these amazing pics to Marj Dee, Fotog_gal on Instagram. Pictures taken at Travel Town in Burbank, CA. This was another fun collaboration for us! Travel Town is a great location, if you’re OK with being overdressed and surrounded by munchkins having birthday parties (see them peeking out of the train window? I’m sure there are some outtakes of me making faces back at them). It was a beautiful overcast morning with soft light and awesome patina everywhere. 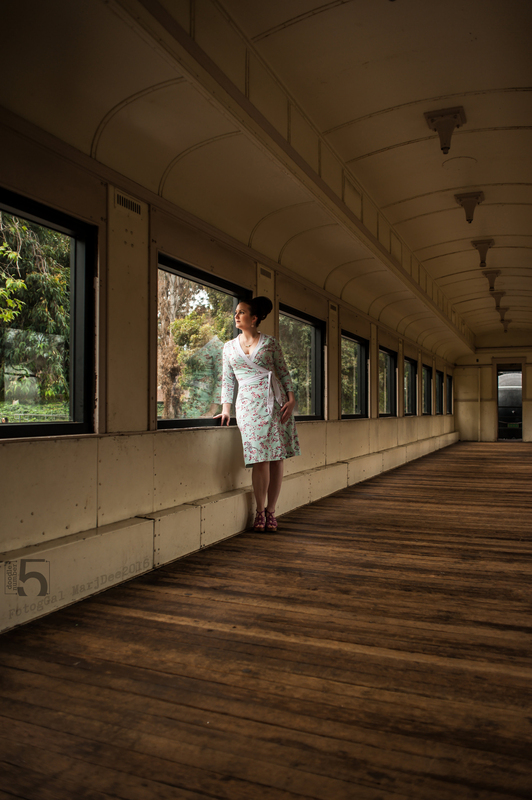 My next post will show another dress from this pattern, and talk a bit more about this particular shoot. This Art Gallery knit is really delicious! An empty train car open for exploration. My screaming fans hanging out of the windows. It’s nice to have an entourage. Looks fabulous! I love 70s style too and have drooled over the DvF dresses for what seems like ages. I just picked up the pattern 🙂 How did the cotton/spandex work? It seems like this type of pattern is meant for a slinkier knit — did it work ok with a fabric that has more body? Definitely slinkier is better (like the muslin, and I’ll have a separate post up tomorrow with a poly/ rayon mystery blend). The cotton lycra is OK but it doesn’t move as nicely with the two layers in the skirt front, and the recovery in the bodice is not spectacular. The bands made with brushed poly helped to correct that though- they have great recovery. 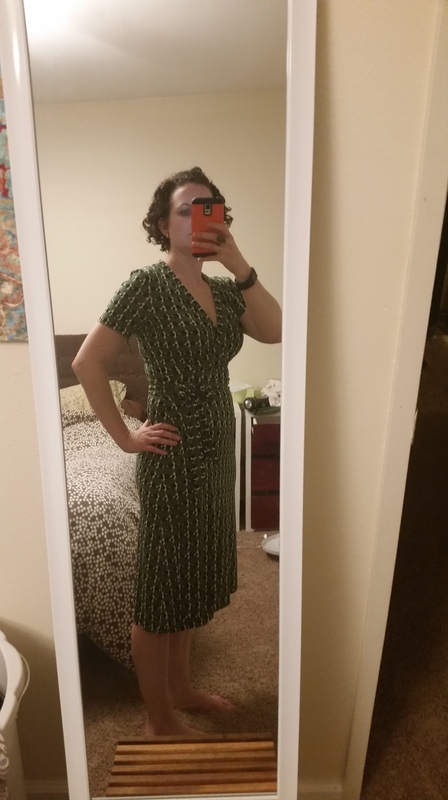 Hi, So, this pattern is a modified wrap dress? No more pins (other than the cleavage, which just is what it is?) Nice work!